Thunder chickens beware, we’re coming for you! 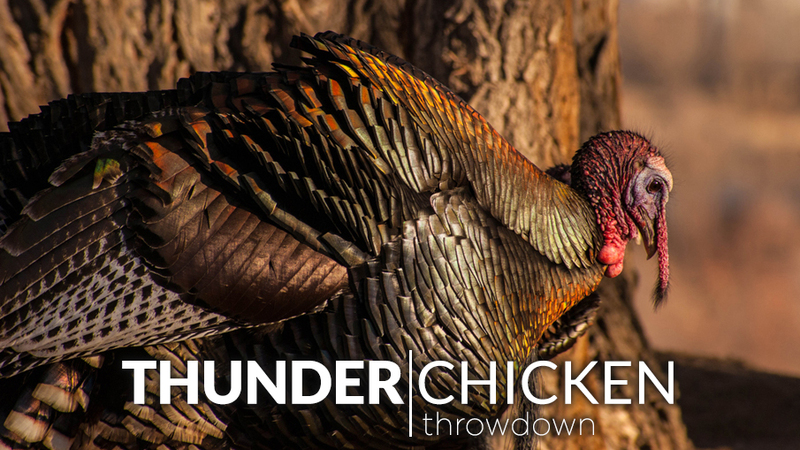 This week on The Revolution with Jim and Trav, it’s all about the spring gobbler smackdown and our panel of pros are out for beards. Joining us will be David Blanton of Realtree Outdoors and Monster Bucks. Rounding out our panel will be outdoor writer M.D. Johnson and Pete Muller from the National Wild Turkey Federation. Tune in for spring turkey hunting tips on The Revolution, presented by Outdoor Channel, Sportsman Channel, World Fishing Network and MyOutdoorTV. Realtree is a powerhouse name in the outdoor industry and the people behind the brand are the real deal outdoorsmen and women. David Blanton with Realtree and co-host of Realtree Outdoors on Outdoor Channel, joins The Revolution this week for a fun and informative two-part interview. To kick things off, David talks about the all-new Realtree EDGE. If you haven’t seen this pattern yet, you need to check it out! David tells Jim and Trav that because of a turkey’s incredibly keen eyesight, good camouflage is an absolute necessity. More than four years in the making, this new pattern works at both close and long range to disrupt the human form. David explains how effective this pattern is at any time of the day – in full sun where the contrast really performs to a hunter’s advantage and even as the sun is going down where the pattern mutes itself for a natural blend. Furthermore, he’ll talk about the process of creating a new pattern and the big shoes they have to fill with their existing popular and successful patterns. David will then focus his attention on turkey hunting. Admittedly, he likes to be where the action is and prefers a run-and-gun hunting approach to turkey hunting. Rather than sitting and waiting for hours on end for a bird to come in, he works to find the turkeys that are vocal and willing to play the game. This not only makes for exciting hunts for him, but also for viewers when they relive his hunts on television. David tells Jim and Trav that hunters don’t have to be world class turkey callers to be great turkey hunters, they just need to be able to read the situation and know when to call, how to call, and when to move. Over-calling, or calling too loud, can be off-putting to birds so David advises hunters to mimic or take queues from the hen or tom they are pursuing and base their calling off of how vocal those birds are. In addition, he cautions hunters not to get in a rut with their calls and instead work on changing up the rhythm and cadence so that they aren’t exactly the same each time. David will also talk about mistakes to avoid when turkey hunting this spring. Don’t miss this information-packed interview with the one and only David Blanton of Realtree. Public ground can test even the most seasoned turkey hunter’s woodsmanship and skillset. Setting out on public land in search of a gobbler requires a hunter to be disciplined and able to change their tactics based on the situation they are dealt. This week, outdoor writer M.D. Johnson joins The Revolution to talk about his recent article Increase Your Chances on Pressured Public-Land Turkeys in Game & Fish Magazine, with some tricks to hunt public land more efficiently. M.D. tells Jim and Trav that scouting is a huge part of any turkey hunt, something that needs to be taken seriously by the hunter. He encourages turkey hunters to scout the same way they’ll hunt – with the same intensity, same stealth, same strategy – just without their shotgun. He also underscores the importance of patience, saying that patience, persistence and self-discipline are especially helpful when hunting public land. He tells Jim and Trav that being willing to sit for another half hour, being willing to put your call down and go silent for a while, the ability to let a tom gobble a few times before you answer – these are some things that can contribute to your success. Listen in as he explains why public land hunters shouldn’t coax a bird to do too much talking, so as not to give away the location of your bird to every other hunter in close proximity. Instead, use a limited amount of gobbling to glean critical information, such as: location, interest, what kind of bird they are communicating with (jake or mature tom), how many birds they are communicating with and more. Tune in for more great tips on hunting public land gobblers! The restoration of the wild turkey may be one of the greatest conservation success stories in our history. A once fragile population has been brought back from the brink and today, more than 7 million birds are scattered across the country. An accomplishment like this doesn’t happen overnight and it certainly can’t be facilitated without a dedicated group of individuals working toward a common goal. The National Wild Turkey Federation (NWTF), founded in 1973, has been instrumental in this success story. Tune in to The Revolution this week as Pete Muller, Public Relations Manager for NWTF, talks about their mission and focus on the future. Working toward the future NWTF has instituted a 10-year initiative, “Save the Habitat. Save the Hunt.” They have set impressive goals for this endeavor: conserve or enhance 4 million acres of critical wildlife habitat, recruit 1.5 million hunters and open access to 500,000 additional acres for hunting. Already five years into this initiative, Pete tells Jim and Trav that they are making an incredible amount of progress and are more than halfway there toward meeting every goal. Pete will explain how they are working hard to improve habitat where not only turkeys will benefit but all other wildlife, as well. He’ll also discuss the absolute necessity of recruiting new hunters. Hunters fund a large amount of conservation efforts through the Pittman-Robertson Act as well as through the purchase of hunting licenses. Keeping a steady and growing number of hunters is crucial for the continued funding of conservation. Tune in for an informative look at the National Wild Turkey Federation’s contributions to habitat, conservation and the legacy of hunting.